Effortlessly built a clean personal portfolio. Qanvas is a handsome finely handcrafted portfolio WordPress theme built for creatives. Qanvas allows you to quickly and easily create a beautiful, simple and professional portfolio. Create extensive case-studies by mixing up galleries, video and audio, create a simple and to-the-point portfolio. The sky is the limit. 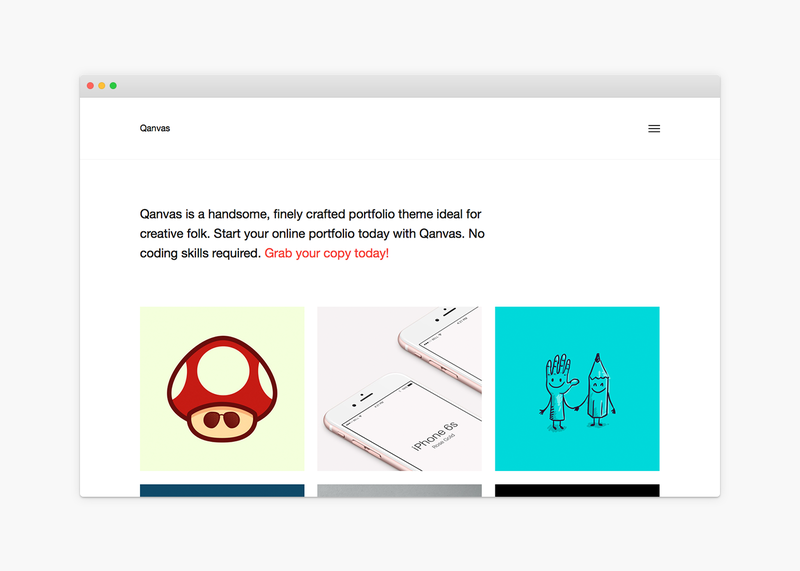 Qanvas features a super clean and handsome design that allows your portfolio to speak. Use the built-in portfolio media-blocks for your work. Mix up unlimited galleries, videos and audio tracks. Use Qanvas as a blank canvas and utilize the WordPress native Customizer to really make it your own. The Masonry script behind the grid layouts allows you to add portfolio pieces in all sizes and shapes.